The bacon, egg and cheese sandwich is sacred, declares Pete Wells of the New York Times. 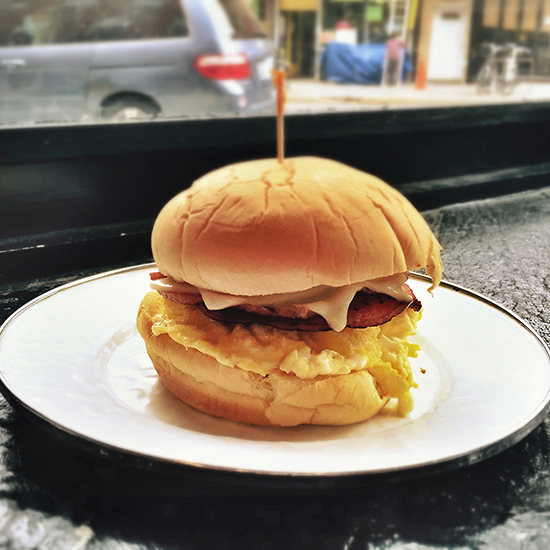 In a recent piece, he waxed poetic on the cheesy, cheap and quick deli-, bodega- or cart-made breakfast sandwich that keeps New York City running. We know Wells (he used to be an F&W editor), and we agree with him: The BEC (as New Yorkers sometimes call it) is an important part of NYC cuisine that needs no tinkering or upgrading. But it’s not the only unfancy breakfast sandwich worth waking up for. Here, five more regional breakfast sandwiches (and wraps) that deserve your love. Just a quick hop across the Hudson River from NYC takes you to New Jersey, the land of pork roll. The Jersey Breakfast consists of crispy, griddled slices of that Spam-esque meat (also called Taylor Ham), fried eggs and cheese—typically American. Popular in Cincinnati, goetta is a breakfast sausage made with ground meat (usually pork or a mix of pork and beef), oats and spices. Though it’s typically fried and eaten as a side dish, it’s also served as a sandwich on toast with a fried egg and cheese. Scrapple, the Mid-Atlantic’s famed spiced pork mush (also known as pan rabbit), is a breakfast staple. Sliced into squares and pan-fried until crispy with a charred crust, the patty is eaten both as a side dish and in a sandwich on toast with scrambled eggs and cheese. Though you can find breakfast burritos almost anywhere these days, New Mexico is known for its green chili-laden versions. The chili sauce can be in the burrito (along with eggs, potato and some sort of breakfast meat) or poured on top along with melted cheese. Like the breakfast burrito, the breakfast taco is now a ubiquitous menu item. But Austin, Texas, has truly claimed it as its own. There’s no definite recipe, but all breakfast tacos in Austin should include scrambled eggs along with beans, cheese or potatoes—and the salsa has to be fresh and spicy.